Looking for a Southeastern fence company to supply horse fencing for your farm in the Georgia, Florida or North Carolina area? At Fence Workshop™ we have exceptional experience supplying wood and wire horse fencing, vinyl post and rail horse fencing and more. We specialize in supplying custom, superior designed horse fences and other large animal fences. As most horse owners know, horses love to test the boundaries of fences. From cribbing on wooded posts to pawing at wire, if your horse fence is not built correctly, your horse will point it out. At Fence Workshop™, we can supply any style of horse fencing to match your budget but strongly recommend something more substantial than barbed wire alone. Because of our extensive experience in the industry of fencing, we understand just how curious animals can be around your new farm fence. We understand what materials, procedures and precautions to take to ensure our farm fences stand the test of time and curiosity of large animals. We go the extra mile to ensure safety and security is part of your horse fence. Wood horse fences are the most traditional style wood fence available. Wood board as well as wood and wire fencing has an appealing look and is the exact fence that really makes you feel like you’re home. Wood board fences are perfect for horses, cattle, farms and ranches. Wood board fencing can add a tremendous amount of value to your farm or ranch and can provide a large return on the investment in the fence if the property is sold. Vinyl horse fencing is strong and long lasting! When constructing a horse fence for your property here in Georgia, Florida or North Carolina – Fence Workshop™ recommends vinyl in addition to the traditional wood horse fence. Vinyl is great because it has some give to it while also being strong. Vinyl doesn’t splinter like wood fences. The splintering that can happen with a wood fence can be a danger to horses enclosed within the confines of a wood fence. Vinyl fencing helps to reduce “cribbing” or chewing that can happen with wood fences, because horses don’t like the feel of the vinyl on there teeth. These facts make vinyl a great option for Horse fence customers looking for quality fence materials. 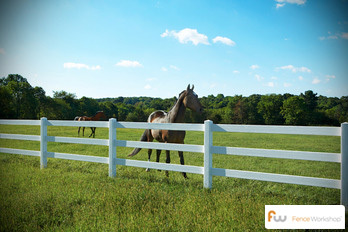 Wood and Vinyl post and rail fences are both popular horse and farm fence options. When installing and planning your horse fence consider safety and security the top priorities. Wood provides a more budget friendly option and is a versatile horse fence building material in its own right. However, vinyl is also a viable option. Wood and Vinyl are both popular horse and farm fence options. When installing and planning your horse fence consider safety and security the top priorities. Wood provides a more budget friendly option and is a versatile horse fence building material in its own right. However, vinyl is also a viable option. Where do we sell our horse fences? At Fence Workshop™ we supply horse fences in Georgia, Florida and North Carolina areas like Atlanta GA, Athens GA, Augusta GA, Columbus GA, Macon GA, Alpharetta GA, Marietta GA, Conyers GA, Lawrenceville GA, Woodstock GA, Braselton GA, Orlando FL, Apex NC, Cary NC, Chapel Hill NC, Holly Springs NC, Raleigh NC, Wake Forest NC and many more. As always, all of our fences come with a best in class manufacturer warranty.